What this means to the triathlete mastering the sport is that practice and exposure to the same kind of stressors in the race environment will mean the body adapts better and is able to respond successfully on race day. For T2, this means setting up a streamlined transition area, practicing a fast dismount, and perhaps most importantly, educating the legs on making the change from riding to running through practice and a change in focus toward the end of the ride. Continuing on the theme from Transition Clinic Part 1: Swim to Bike, keep your set up simple. Shoes should be placed with the opening ready for your foot. A bungee lace will make this easy and no tying is required. Sprinkle baby powder in the shoes if you aren’t wearing socks. This helps reduce friction that causes blisters and also helps the foot slide easily into the shoe. If you are wearing socks, have them rolled and set up so you can just slide the foot in one motion. A visor or hat and a race belt with your number should also be nearby so that you’re more likely to remember to put them on. In case something was lost during the ride, I tell my athletes to leave an extra bit of nutrition and a bottle filled with sports drink in transition. I usually take a three-second pull on the bottle while in T2, and I also take a salt tablet if the temps are high. 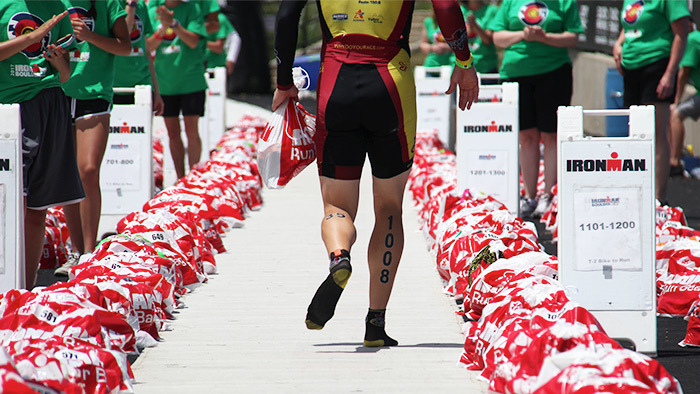 Keep whatever fuel will be used on the run near your shoes so you can take some in before you head out of transition. That being said, remember that in a short course race, fueling becomes less of a concern. In long course racing, taking the time to eat half a banana and take salt with fluids while you’re exiting transition can help with the run. No matter what the distance, try not to spend time sitting or being still. Every second counts in a short course, but the same thinking can be applied to long course events where the time is better spent moving forward toward the end goal rather than staying in one place. Triathlon transitions require practice. This is twofold, both the physics of dismounting and the physiology of the body in transition. If you feel capable, learn to dismount your bike leaving your shoes on the pedals. This is easier to master in races that have a slight downhill or flat leading into transition. Riding with your feet on top of the shoes in the last 400m makes this move simple. Once off the bike, grab the nose of the saddle and propel your bike forward. Keep a high cadence with short steps as you make your way to the rack. Try incorporating this practice into training during your race-specific prep period. Every ride can end with a few dismounts and 10 to 20 strides of pushing the bike. Eventually this can extend to a full transition practice with a short run or workouts that mimic your particular race-day environment. For example, if you know your run course begins with a steep hill, try practicing in an area where you can find that type of terrain in order to prepare your body and your mind for this challenge. A simple switch in mental focus and a self check-in during the last eight to 10 minutes of the bike can help with a better transition. If the opportunity exists, stand up for a few five to 10- second intervals to change the position of the body and the blood flow. Then, add in some higher cadence spins. Finally, be mindful of stretching your running muscles before you dismount. By loosening the back and hamstrings, the change from pedaling to running won’t feel so severe. Note hydration and fuel status while in the last portion of the ride. How do you feel? What can you do to make the switch to running easier? As with much of sport, practice is essential to achieving success in triathlon transitions. The more you can do this outside of competition, the easier and faster it will be on race day. Remember these key steps: set up a streamlined transition area, change focus toward the end of the ride and prepare for a great run.